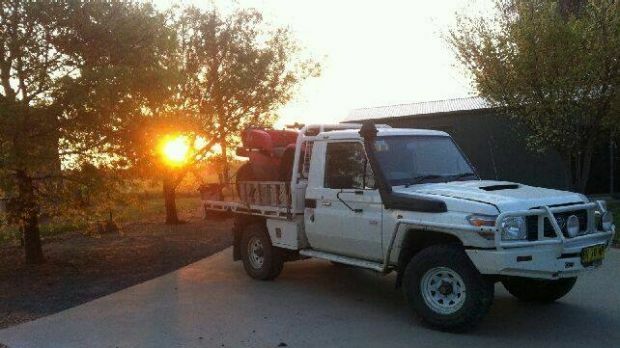 Oct 21 – Outback father-and-son bandits the Stoccos were able to flee interstate and cause havoc despite bashing a police sergeant in Queensland three months ago, some of their frustrated victims have told Fairfax Media. 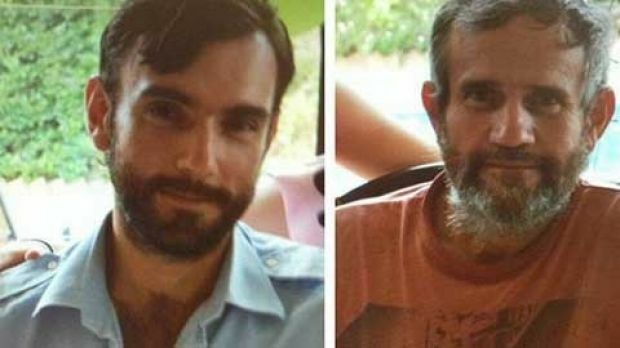 Gino and Mark Stocco were reported to have last been seen in a stolen white Toyota landcruiser utility heading north on the Hume Highway on Monday, after getting fuel at an Euroa service station in north-east Victoria. The 58-year-old father and his 38-year-old son have spent eight years on the run from police. Fugitives Mark Stocco, 35, and Gino Stocco, 57. A spokeswoman provided details of a recent assault on police involving the Stoccos. She said the assault had allegedly occurred after a man was reported to have stolen something at a grocery store in Scott Street, St George, at about 12pm on June 14. The man threw a bottle at a police officer who called on him to stop. The spokeswoman said the offenders were placed on a Crime Stoppers most wanted list and media releases were issued. Mr Redding said he was told that the policeman was set upon by the younger Stocco, Mark, who was then assisted by his father Gino in the assault on the officer. The assault is just the latest in a lengthy list of crimes undertaken by the pair as they roamed for eight years across a remote rural zone stretching from north Queensland to Victoria. It was only on Friday that the Stoccos became the target of a major police operation code named Strike Force Kalkadoon after they were alleged to have fired two shots at police near Wagga Wagga. 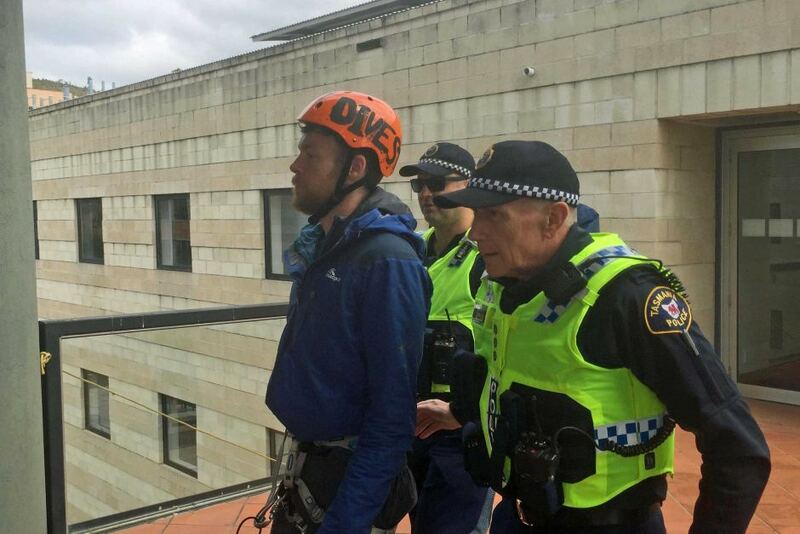 21 Oct – Police in Tasmania have arrested a fossil fuel protester perched on the roof of the University of Tasmania’s Sandy Bay campus. 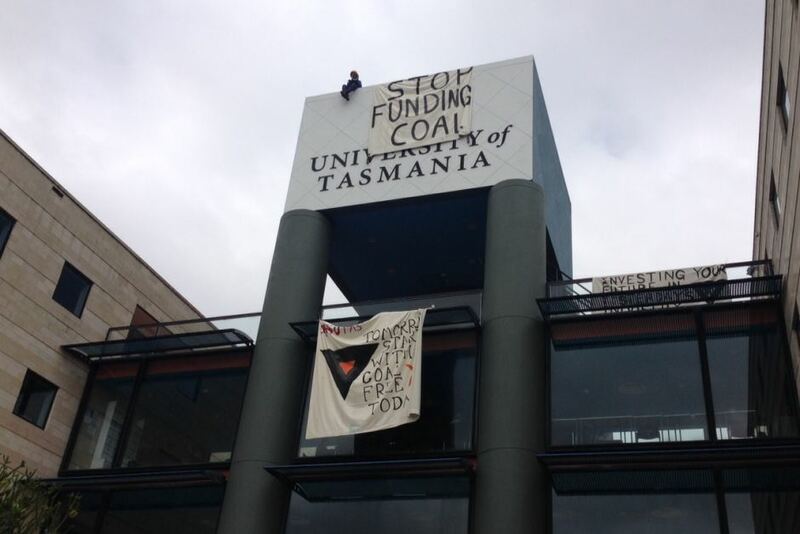 Campaign group Fossil Free UTAS said the university had been refusing to meet to discuss its demands that it stop investing in coal. The group unfurled three banners and protester Brodie Jeavons refused police requests to come down. Police search and rescue personnel were sent up to arrest him and charged him with trespass. In a statement the university said the protest was dangerous and it referred the matter to police. We have interrupted this event due to it being sponsored by the Turkish government. The Turkish government is currently waging a campaign of terror against the Kurdish and progressive left movements in Turkey. This campaign has involved covert support for extremist Islamic organizations such as the so-called Islamic State; mass arrests and imprisonment of Kurdish and left-wing activists, community leaders and politicians; mass censorship and restrictions against social and news media; maintaining a military blockade that prevents humanitarian aid from reaching the Kurdish autonomous region of Rojava in Syria that is under constant attack by IS; the murder of prominent Kurdish and left-wing activists; launching airstrikes against Kurdish guerrillas in Iraq who have been one of the most effective fighting forces worldwide against IS; and most disturbing of all – facilitating terrorist attacks against peaceful and democratic protests. The most recent of these attacks took place on the 10th of October in Ankara, Turkey’s capital. At least 128 people were killed and hundreds more were injured when twin explosions hit a peace rally organized by the trade union movement. The Turkish state’s immediate reaction following this horrific attack was to order it’s security forces to deploy tear gas and water cannon against people rendering aid to the survivors and to implement a media blackout on reporting about the attack as well as blocking it’s citizens from accessing Twitter and Facebook. The government then went on to make the outrageous claim that Kurdish or left-wing groups could have been behind the attack and to impose further restrictions on reporting or releasing information related to the attack. The Australian government regularly makes grandiose announcements and engages in much media posturing regarding it’s supposed involvement and commitment to the so-called ‘War On Terror’ – in particular the war against the Islamic State. However, the Australian government maintains normal relations with the Turkish state – a state that routinely terrorizes it’s own population and covertly funds and arms the Islamic State, Al-Nusra Front and other violent Islamic fundamentalist groups that are currently terrorizing the people of Syria and Iraq. The Australian government also lists the PKK (Kurdistan Worker’s Party) as a ‘terrorist’ organization at the behest of the Turkish government. It is widely recognized throughout the world that the PKK is currently one of the most effective fighting forces worldwide against the Islamic State. The PKK are also recognized worldwide for their heroic role in the rescue of thousands of Yazidi people from the Islamic State on Mt Sinjar in Iraqi Kurdistan. STOP THE TURKISH STATE’S WAR AGAINST IT’S OWN POPULATION! END AUSTRALIAN COOPERATION WITH THE CRIMINAL ERDOGAN REGIME! SOLIDARITY WITH THE KURDISH STRUGGLE AND THE PROGRESSIVE LEFT MOVEMENT IN TURKEY! 2 Oct – Short-sightedness, weak adherence to the law and poor working conditions in Cambodia’s garment sector are creating a fertile field for strikes to prevail over negotiations, a recent study released by the Arbitration Council Foundation, an independent labour mediator, has found. According to the study, incidents of striking have considerably increased in the disputes the council mediated, going from 17 in 2012 to 94 in 2014. While compensation issues were by far the most common demands in strike cases the council oversaw – making up 37 per cent of all cases during a one-year period from April 2014 to 2015 – it was far from the only factor enabling the proliferation of strike action. Because many employers offer only the most minimal protections required by the law, strikes are not used as a last resort but as a negotiation tactic, the study says, beginning on an “ad hoc basis rather than as part of a campaign to achieve broad based CBAs [collective bargaining agreements]”. CBAs, or governing contracts drawn up between unions and employers, are seen as smoothing industrial relations by avoiding the use of strikes while setting up clear standards for workers. But a range of issues hamper the effective implementation of CBAs in Cambodia, according to the report, such as the lack of a separate labour court to handle cases involving a wide number of demands. “An inability to promulgate various claims at one time and achieve a longstanding resolution in the form of a CBA provides many more ad hoc opportunities for strikes to occur,” the report reads. Employers’ tendency to reimburse striking workers’ salaries has also led to a system in which strike pay is used as a consolation prize, often awarded in lieu of strikers’ more “substantive demands”, the report says. Meanwhile, the industry’s attempt to co-opt the labour movement through the use of pro-employer, or “yellow”, unions has had the side effect of proliferating minority unions as workers become frustrated and disenchanted with yellow representation. William Conklin, country director of the US-based Solidarity Center, said that Cambodian workers’ overreliance on strikes exists largely because other measures lead nowhere. Conklin added that effective CBAs were largely absent due to the little respect employers paid to minimum labour standards, leading to confrontation rather than negotiation as the chief conduit of action. “You can’t have dialogue when [only] union members are being terminated,” he said. However, Ken Loo, secretary general for the Garment Manufacturers Association in Cambodia, said that establishing CBAs was difficult due to minority unions disrupting the CBA process merely to “get benefits out of the situation”. Loo added that unions themselves did not respect the Labour Law when they went on strike, ignoring rules such as providing prior notice. “All their strikes are illegal, they don’t comply with procedures,” he said. 4 Oct – A prisoner who escaped a minimum security jail in New South Wales more than two months ago has been arrested after being found hiding in a kitchen cupboard. Myles Fergus Wilson, 58, was reported missing on July 24 after a check of inmates at St Heliers Correctional Centre in Muswellbrook, north-west of Newcastle. After a search turned up no sign of Wilson, he was reported as an escapee to local police and extensive investigations commenced, police said. On Sunday night, officers found the man hiding in the kitchen cupboard of a home at Alfords Point, in south Sydney. He was arrested and taken to Sutherland Police Station, where he was charged with escaping lawful custody. He was denied bail and will appear in the Parramatta Bail Court today. 15 Sept – On his way back from terminating the Maori occupation of Kaitaia Airport, Police Superintendent Wallace Haumaha was diverted to Lake Horowhenua to deal with another Maori occupation. Last Sunday, more than twenty Mua-Upoko owners took possession of the former Sailing Club building overlooking this privately-owned lake. Superintendent Haumaha warned these owners he could arrest them and lock them all up in jail, but was prepared to let the status quo remain while he conducted some investigations. However, former Horowhenua District Councillor Anne Hunt was on hand to show Superintendent Haumaha copies of various court judgements including one from the Supreme Court confirming that the clubs were unlawfully occupying buildings that belong to Mua-Upoko. She also pointed out that the Crimes Act justifies owners entering their own buildings during the daytime for the purpose of taking possession thereof. Mrs Hunt says she is concerned that the police still assume that Lake Horowhenua is the subject of a Treaty claim. Nevertheless, Parliament passed a law in 1905 letting the public use this privately-owned lake free of charge. Mrs Hunt says research commissioned by the Waitangi Tribunal confirms her suspicion that the Crown never bothered to consult the owners first, and as far as she is concerned, that is “theft by statute”. The owners have never received any compensation for the use of their lake. Both the Rowing and Sailing Clubs had erected clubrooms on this freehold land without bothering to get permission from the owners first. The Court has already confirmed that as fixtures, these buildings now belong to the Mua-Upoko owners. The other Domain building is occupied by members of the Horowhenua Rowing Club, who refuse to vacate the building even though their licence to occupy expired in 2007. The Court of Appeal has since established that the Reserves Act prohibits any attempt to extend this lease even on a month-by-month basis. Last Sunday, the owners recorded footage of the rowers trespassing on a waahi tapu site to launch their boats. Judge Atkins had warned them not to do so, and had summoned Police Inspector Mark Harrison to an in-Chambers hearing to put in place protocols to prevent further culturally-offensive behaviour. Cr Jo Mason testified in court that rowers urinated in this area because there are no toilets in the building. Mrs Hunt says that many of the owners believe they have been forced to tolerate this situation long enough. As 30 October marks 110 years since the Horowhenua Lake Act was passed, the owners are preparing to take back control of their own property and decide who can use their own facilities. Plans are in place to set up a waka ama club this weekend, and negotiations will continue this week to decide what happens to the northern building at the Domain.